I really enjoyed completing this SciPack. I was doing a unit on plate tectonics, so this information was very relevant. From this information I was able to reteach myself some of the components about our Earth. I've taught 5th grade science for 11 years, so we always touch on changes to Earth's surface in my class. My students always have deeper questions that I'd love to be able to explore in more detail, but I haven't always had the answers for them or ways to explore their questions. This SciPack helped me brush up on my understanding of this huge topic and gave me insight into how I might be able to answer their questions and reminded me of high school concepts I haven't thought about in years. This Sci-pack was a great review of weathering, erosion, and components of Geology. I loved how this resource gave ideas on how to relate these topics to relevant issues that my students would be very interested in. The structure of the SciPacks really help me understand the underlying concepts that surround each topic. Initially, I was unsure of how well I'd grasp scientific concepts in a self-paced, online format, but the carefully sequenced topics, interactive activities and simulations, in addition to the voice-over explanations work well together to help deepen my understanding in the content area. Especially valuable are the pedagogical implications and common student misconceptions. I feel a lot more knowledgeable about a subject after using a SciPack, and I highly recommend the Earth's Changing Surface SciPack to anyone needing to learn more about scientific topics! I used this to help review for the Praxis II test. 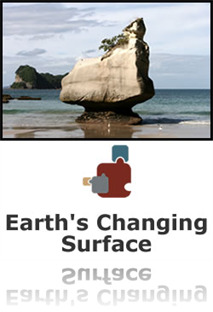 The SciPack provides a straight forward explanation related to the events that change the Earth's surface, whether fast or slow change. I used this resource a lot in my middle school Earth Science Class and also as a C-DEBI asset during ALI'I with great results! This SciPack offers a brief yet comprehensive overview of plate tectonics as well as different types of weathering and erosion processes, both natural and human influenced. The text is a great resource for review of familiar content. There are some inconsistencies in the quizzes and the final assessment questions that inaccurately portray concepts from the text with either poorly worded questions/answers, unreadable graphs, and information that is not communicated in the text itself. With that said, this SciPack is mostly well organized and easy to read. I would recommend this as a brief refresher if you already feel mildly confident with the subject matter. I enjoyed the modules, and how it had the option to play the audio on each web page. I also liked the review questions at the end of each section. The only thing that was a problem for me were the videos on the pages, I could not get any of them to work. Overall, it was a great review for me. Thanks! Earth Science is not my favorite topic, but this SciPack broke the subject down quite well and presented it in a way that was engaging and easy to follow. The progression through the material had an easy flow. I really appreciated the diagrams and interactives throughout the descriptions. There was also a lot of interesting questions that were posed in the beginning that I could use in my own classroom. I felt like there was a lot of overlap between this SciPack and some of the others, with the others expanding more on the different sections in this. In that sense, this SciPack could be an introduction to the others. I'm thinking specifically of the Plate Tectonics and the Resources SciPacks That said, there is a lot of unique material in this SciPack--I don't think chemical weathering is covered anywhere else, so the SciPack is worth the time. I believe that this Sci Pack took me the longest to get through. I teach most of this material, which made it very relevant to me, but the way the material was presented was dry in a lot of areas. However, if you can get used to the "lecture style" of this Sci pack, you will come out of it knowing SO MUCH about the Earth and how it changes. I will definitely be using most of this information in the coming weeks of my teaching! I found this SciPack to be informative as a refresher. The content isn't anything that I did not already have knowledge of. However, the assessment put a lot of emphasis on boundaries and the land formations that can be caused from them while the training did not. I am not sure of the significance of the depth for this SciPack. I would have liked to have seen a more direct correlation between content and assessment. The information contained in this Scipack was somewhat useful. I found it very time consuming and the information was very repetitive. The assessment was much harder than I expected and had way too many "check all the apply" questions. The reason I say this is because you don't even get partial credit for these, which is a little rough. I went completely through this Scipack twice, only to fail the test twice. It took three attempts to pass this test because several test questions had multiple correct choices and, missing even one choice, counted the entire question wrong. It would also help to be able to see exactly which questions were answered incorrectly so it would be possible to see where mistakes were made and why without having to review and entire section. Sorry I chose this Scipack out of so many other options. It cost me HOURS of time that I can ill afford this summer! As another teacher pointed out, there were a lot of typos in the material. It had not been edited as thoroughly as many of the other SciPacks. The audio program often didn't conform to the written text. Rough around the edges and redundant with some other Scipacks in the Earth & Space area. The final assessment, again, lacked consistancy in that some questions were superficial and others were trick questions having little value in measuring comprehension and mastery of the subject matter. The graph of the temperature gradiant and the melting rock/magma was a waste of time. Some of the pictures in the final were not clear enough to really determine what they were supposed to represent. Rather than lifting a poor picture from the SciPack exercise how about lifting a good picture. If you're going to cut and paste at least pick a picture that is a good example of something. Liked the SciPack but found the final test odious. This SciPack needs a lot of polishing. Diamond in the rough, for sure! There were several places throughout the SciPack where there were uncorrected typos. Also, in the section comparing the Colorado and Mississippi rivers the article stated that both rivers have been important to humans since the colonization of North America. This is incorrect. It should have said since the migration of humans to these areas of North America. Finally, in several instances the quiz told me that I was incorrect in an answer when I used a a synonym for the word the quiz identified as correct such as decreased instead of slowed down. Also, I was told I was incorrect when identifying specific regions on pictures even though I clicked on the right area because the link area was too small.